Today I am beating the Monday blues with a little bit of sorcery, in the form of Muscari aucheri ‘Blue Magic’. Better known as grape hyacinths, muscari are absolute gems when it comes to filling pots or small gaps at the front of a border. M. ‘Blue Magic’ is a sturdy and non-invasive hybrid, unlike the dastardly species, Muscari armeniacum, which romps around my parents’ garden with gay abandon. For a lovely spring display, use an 8″-10″ diameter, shallow pot and plant with at least 25 bulbs in September or October. They should be positioned so they are close but not touching. For a really bountiful display, plant two layers before covering with 3″ of compost. I always top the pot off with an inch or so of horticultural grit to deter slugs and snails, but mainly because it looks more presentable. 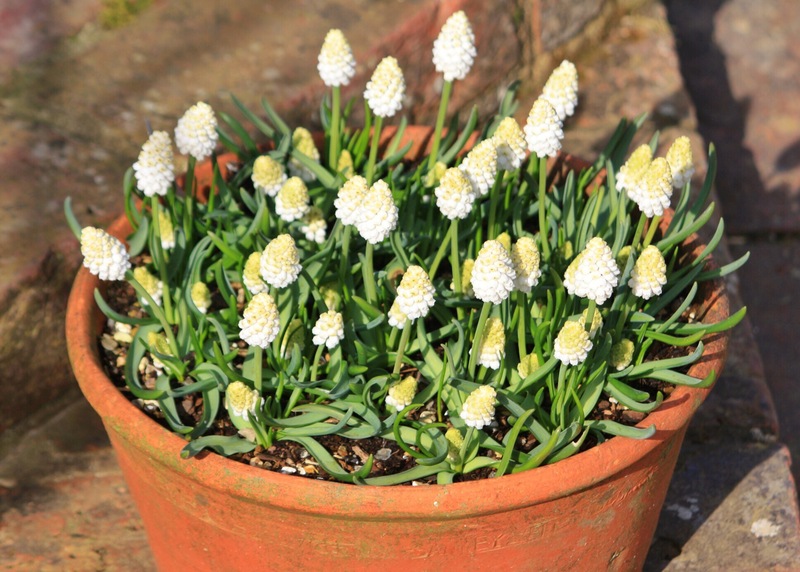 At Sissinghurst Castle this weekend I spied several pots of muscari placed around the gardens, notably M. ‘White Magic’ in the fabulous White Garden (above). One know’s one’s doing something right if they do it at Sissinghurst. I reckon the pot above would have been planted with about 25 bulbs, each producing 2 or 3 flower spikes. In our coastal garden the distinctive flowers of M. ‘Blue Magic’ are rising from flattened rosettes of narrow, bluish leaves. As they age the lower flowers will develop a pronounced whitish rim, whilst the uppermost flowers transform into a jaunty blue topknot. Once the flowers are over the bulbs will be transferred to the ground ‘in the green’, but planted a little deeper than they were in the pot. To banish any residual blues, tomorrow I’ll be off to the RHS Spring Show Late, which promises abundant flowers accompanied by craft beer, pasties and live music. What more could a Cornishman wish for? Beautiful! My Muscari haven’t bloomed yet. Unfortunately, I think I have the armeniacum. They do romp! Oh yes! Even in a lawn or through crazy paving. Nothing stops them! It went over to my neighbor’s sidewalk. Oops! I’ve been trying to get rid of some and make sure they never go to seeds! But they are pretty. You’ve sure got the right idea about beating Monday blues. 🙂 It sure looks pretty compared to the snow we got all day. Still snowing over there? Blimey, I forget how long your winters are. It has been 20 degrees for a few days on the trot now so the garden is going mad. I guess you have mud to look forward to before the bulbs get going? I like the idea of Muscari in pots and a double layer even more, but I am not sure about the white magic, the blue magic however are just lovely. 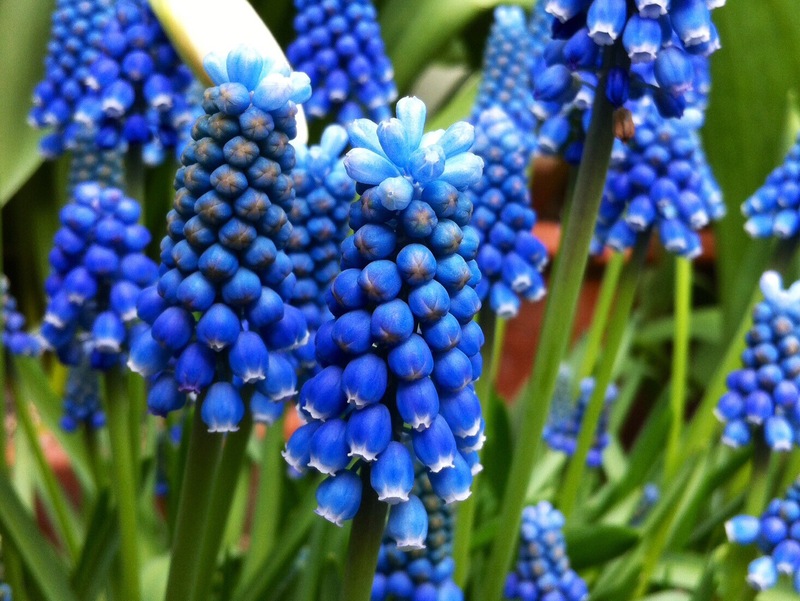 I’m with you – I like my grape hyacinths blue or deep purple. I also planted ‘White Magic’, but they are not as strong overall.